Rated R for language throughout, drug use, some sexual content and disturbing behavior. There's a popular website devoted entirely to the "downfalls" of Instagram celebrities, those camera-ready people (mostly women) who transform their lives into a "brand." The Instagram feeds feature "personal" photos of laughing babies, vaguely bearded husbands, shabby-chic lofts, chunky dinnerware, each post tagged with affiliate product links. Everyone knows these feeds are fake, or at least "curated" within an inch of their lives, but the most successful ones have millions of followers. Every so often, one of these celebs "falls." The veil lifts, revealing the flawed human underneath. Schadenfreude is ugly but inevitable. "Ingrid Goes West," the new black comedy directed by Matt Spicer, starring Aubrey Plaza, is so insightful about this sub-culture, about its appeal but also about the traps of believing so fully in what is fictional. The film is very smart, most of all because it resists the urge to devolve into a sentimental redemption narrative. This is a daring comedy with a very sharp bite. When we first meet Ingrid (Aubrey Plaza), she is in the process of crashing a wedding and spraying Mace in the bride's face as retaliation for not being invited. A little bit later we learn that the two women weren't even friends. Ingrid was just obsessed with this woman's Instagram feed, and felt they had a personal connection. A short time in a psych ward follows. Upon Ingrid's release, she falls back into the old pattern. Life is not worth living without an object of desire. A woman's magazine profiles an Instagram celeb named "Taylor Sloane," (Elizabeth Olsen) and Ingrid leaps upon the new obsession with the savvy of a professional stalker. Taylor's Instagram feed (which you can check out here) is a hypnotic onslaught of sunlight, happiness, laughter. Ingrid, using the money she inherited from her recently deceased mother, moves to California to seek out her new best friend. Ingrid sets herself up in Taylor's neighborhood, renting an apartment from an aspiring screenwriter and Batman obsessive named Dan (O'Shea Jackson Jr.). He looks at this awkward girl - who pays her rent in cash, who has a dark cloud over her head - with humor, curiosity, and a healthy dose of skepticism. Maybe it takes an obsessive to recognize a kindred spirit obsessive. Because "Taylor" posts her whole life on Instagram, Ingrid knows the cafes and stores she frequents. Finally, she kidnaps Taylor's famous dog so that she can then "return" it in person. Taylor and her husband Ezra (of course that's his name) are so grateful they invite Ingrid to stay for dinner. Ezra, complete with manbun, is played by Wyatt Russell. Almost immediately, you can sense that all is not so perfect in the world of Taylor Sloane (Olsen and Russell are terrific), but Ingrid is blind to the signs. While you may know where all of this is going, "Ingrid Goes West" doesn't take the well-trod path. Much of the laughter comes from a queasy recognition of online behavior, stuff we all do. (There's a huge difference, for example, between typing "Hahahahaha" in response to a post, and "Heh heh." Which self do you want to present? Personality becomes completely performative.) The film calls to mind "Single White Female", of course, but it has more in common with dark portraits of obsessive anti-social personalities, like "The King of Comedy," "Purple Noon," "Observe and Report," "Young Adult," "Welcome to Me." Can someone like Ingrid be "cured"? How do you develop a personality out of a void? If the whole world is a mirror, then how do you develop a self in the first place? One thinks of Alain Delon as Tom Ripley in "Purple Noon," kissing his own reflection rapturously, while dressed in his friend's dapper clothes. That's not narcissism, not exactly. It's a dangerous merging, an attempt at emotional co-option. 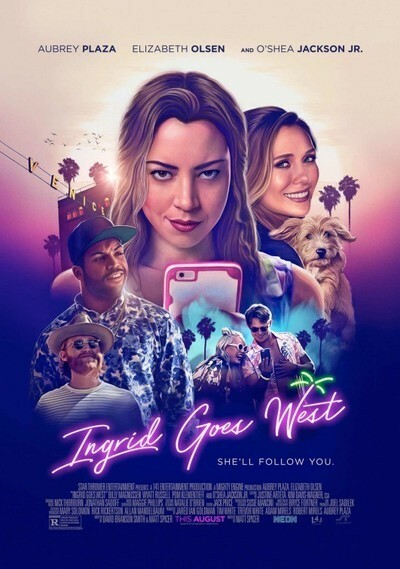 "Ingrid Goes West" could afford to go further into that realm - there are a couple of moments where it wavers in conviction - but, in general, it keeps its eye on the ball wonderfully well. Plaza is, at times, unnervingly blank. She is a compulsive co-opter. She doesn't yearn for meaning. All that exists for her are her needs. You watch in horror as she makes one embarrassing choice after another. Plaza's understanding of the character's inner abyss is extraordinary, as is her understanding that the character couldn't stop even if she wanted to. Ingrid is an empty and damaged woman, grasping desperately for the totally inane and phony surfaces filling up Taylor's Instagram feed. Other actors might plead for our sympathy, or try to "shade in" some of the gaps with armchair psychology. Plaza doesn't. She lets the blankness stay put, lets it fill up with echoes and reflections. Plaza's real gift is in making Ingrid both hilarious and tragic. She doesn't pull her punches. It's part performance, part social commentary. O'Shea Jackson, Jr., (who played his father Ice Cube, beautifully, in "Straight Outta Compton") brings a whiff of the real world outside Ingrid's bell jar, even as he gets roped into some of her schemes, willingly or unwillingly. Ingrid is sometimes like a petulant child, angry that her friend won't play the make-believe games she wants to play. Jackson brings an improvisational energy to his scenes, a sense that he is always thinking more than he is saying. Ingrid takes advantage of him. He lets some of it slide, he calls her on some of it. Ingrid is too caught up in her fantasy to perceive that there's some old-fashioned romantic chemistry with this guy. "Ingrid Goes West" is a biting expose on How We Live Now: sitting on our phones, rote scrolling through someone else's online life, clicking "Hearts" without even taking a moment to absorb the image. The film lampoons stuff that didn't even exist 10 years ago but has now become such a part of our everyday lives that no one takes a second to consider the potential negative effects. If everything is public, then where is the Self? Is turning yourself into a "brand" really a good idea? If you don't take a picture of it and - crucially - share it with the world, did it really happen?